This is the first post of a recurring feature I am introducing on the blog looking at the evolution of cigars through aging. There is a wide held belief that cigars, especially Cubans, improve with age, so from now on I will document how my cigar boxes change in time. Once I receive the cigars and these have had a month or so to rest. It will be interesting to see if the “myths” of cigar aging hold true. Will Cubans really age better than Non Cubans? Do Cubans really need two years from production to have a steady burn? Are full-bodied cigars better than milder ones for keeping? It will be interesting to see although it will certainly take some time. Once I receive the cigar boxes I plan to let these rest for a month or so before trying them; after that I will re-visit each box every six months smoking a couple of cigars and post on how these are evolving. To start things off I am looking at the Punch Petit Punch form Habanos. 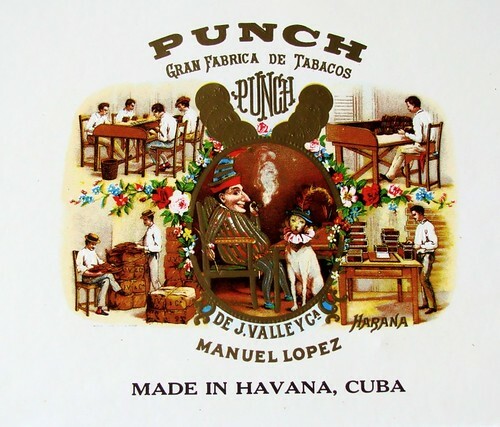 Punch is one of the oldest Cuban brands, established in 1840 and originally targeted mainly at the British market; the Petit Punch (a Perla according to Habanos Vitolaro) has been part of Punch’s range from the pre-revolutionary times, but has been discontinued in 2009 by Habanos as they trim away many of the thinner cigars in their different brands. (While it is understandable that this is happening because thinner cigars are out of fashion and don’t sell, I am sorry to see these go and completely agree with The Smoking Stogie’s passionate rant in defense of smaller ring gauge cigars.) The box I have is from November 2007, so already pass the 2 year mark, and has been in my humidor for a little over two months now. Price: If you can find these (it is getting harder) from the usual Swiss sites they go for around 130-100$ a box, in the UK they sell over 150£. 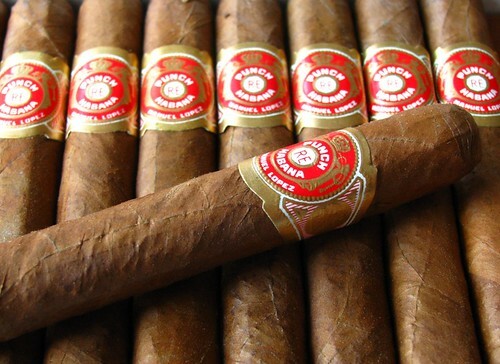 The cigars in the box are pretty uniform in colour, just one or two odd ones out, with a nice somewhat oily colorado wrapper with a rich reddish hue, and most look rolled nicely (neat triple caps clean seams and so on). There are a few veins on the wrapper but they are pretty small. As with many small cigars these feel a bit bumpy, although quite packed. The draw is a bit on the tight side, but not terribly so. I am keeping the tasting note short-ish as this doesn’t want to be a full fledged review but more an impression of the cigar. The start is a bit peppery and nutty. The spice dies down quite rapidly leaving me with intense nutty, toasted and that typical Cuban earthiness taste plus a very creamy and smooth finish. Around the midway point the cigar improves with clear peanut and honey notes on a fantastic creamy finish. The last part of the cigar is a bit of a let-down and the flavours are more muddled up and weaker with just a general nuttiness on some wood and a little spice. The three sticks I smoked all burnt nicely, with just minor issues, but didn’t produce a lot of smoke. Flavourwise they were pretty consistent. At the moment these November ’07 Petit Punch are enjoyable (I scored them 85-87), but having smoked a few of these as singles from my B&M in the past, I know they can potentially get better with richer nutty/honey/wood aromas. Still the cigar certainly does not taste like a “green” smoke and the smooth creamy finish they have makes me feel like I’d happily smoke more now. According to the Cuban Cigar Review site guys, these are best after 4 years so it will certainly be interesting to see if they improve much in the next 18-24 months. This entry was posted in Aging cigars, Cigar Reviews, Cuban and tagged aged cigars, Cuban cigars, Punch. Bookmark the permalink. Very interested to see how this progresses, especially considering I have a box the same age. Looking forward to seeing what else you watch progress too! Hi Dave. if you test these as time goes by I’d love to hear what you think about them. Well I had one straight out the box when they arrived on 6 Nov, then another on Christmas Eve. They both had that characteristic intense dried fruit flavour I get, but the most recent one definitely benefited from some rest. Less ‘gritty’ for want of a better word, the flavours were clearer. I’m going to try and make them last, so we can compare notes if I remember. Very interesting! I’ll be following this one!! !